Gianna Talone-Sullivan of Emmitsburg, Maryland | latest messages - caution: the newer messages, given at Emittsburg are true, but the older set of messages, given to the Scottsdale, Arizona, prayer group are false (including some on Gianna's website). Brides of the Most Blessed Trinity - a Lay Apostolate to pray for priests, they also receive private revelations from Mary and Jesus. Here is a PDF file (1.2 MB) with most of her messages. Sister Mildred Mary Neuzil - Our Lady of America, the Immaculate Virgin - summary of her messages in PDF format (OurLadyofAmerica.pdf) and some more info here. Zeitoun, Egypt (http://www.zeitun-eg.org/stmaridx.htm) - no messages, only apparitions and miracles. Our Lady of Good Success of Quito, Ecuador - Mary's predictions for the 19th and 20th century were a double prediction, referring to that time period, certainly, but also referring to a time of great sinfulness in the distant future, in the 24th and early 25th century. La Madonna di Ghiaie di Bonatehttp://www.madonnadelleghiaie.it - apparitions and messages to 7 year old Adelaide Roncalli during World War II. The apparitions began on May 13th of 1944. "Your prophets have seen false and foolish things for you. And they have not laid open your iniquity, to provoke you to repentance. Yet they have seen for you false revelations and banishments." (Lamentations 2:14). Marie Julie Jahenny of La Fraudais, mystic and stigmatic: "During the time of the approach of the punishments announced at La Salette, an unlimited amount of false revelations will arise from hell like a swarm of flies; a last attempt of Satan to choke and destroy the belief in the true revelations by false ones." Three statements from Archbishop Neary (Tuam Diocese): "In summary the ‘House of Prayer’ has no Church approval and the work does not enjoy the confidence of the diocesan authorities." 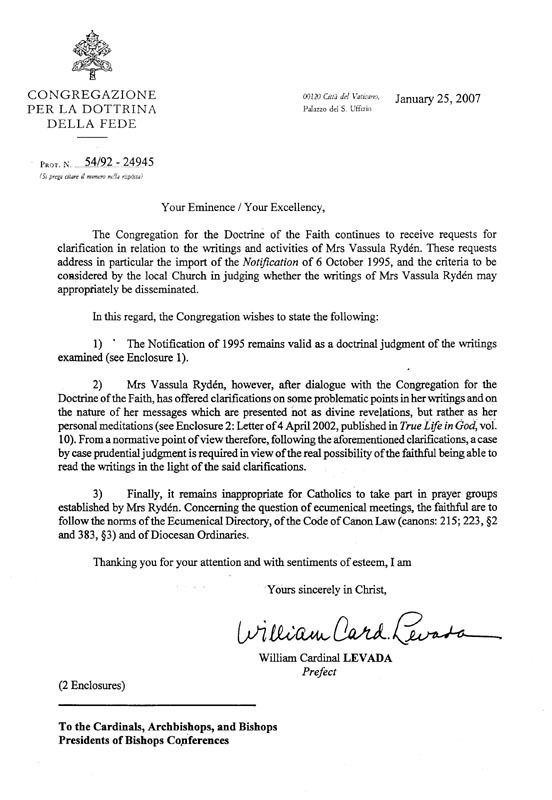 [Evaluation | Evaulation, part 2 | Letter of the Bishop | Decree of the Bishop against "Holy Love Ministries"
25th January 2007 Statement by the Cardinal Levada: "The Notification of 1995 remains valid concerning the doctrinal judgement on the writings examined.... it is reminded that the participation of Catholics in prayer groups organized by Mrs Vassula Ryden is not advisable." The Patriarch of the Orthodox Church has condemned Vassula Ryden's claimed private revelations. 30. jesusmaryjoseph.org - 'the recipient' of these messages is anonymous - the expression: 'The Mother of Perpetual Light' is used on the site. A false private revelation promoted under the guise of devotion to the Precious Blood of Jesus. 40. Timothy J. Comeau and Joseph B. Reyes (http://hometown.aol.com/faith7love/) - a homosexual couple who claim to be the actual two prophets from the Book of Revelation, chapter 11. They also openly reject Church teaching, calling it the teaching of men, not God. 43. Sally Steadman - Our Lady of Toledo, Queen of the Most Holy Rosary Shrine (www.protect-life.org) - claims that human cloning produces human beings without any soul. 48. Josefina-Maria of Melbourne, Australia - claims that Mary called herself the Mediatrix of all graces; Her messages ask people to 'co-redeem the world with me and my Son.' But Christ alone is the redeemer. No one else can redeem or co-redeem the world. Her messages also claimed in 1993 that the reign of the Two Hearts would be established on earth; but we are now in the new century and this has not occurred. The messages promote the heresy of Phariseeism, (e.g. message of 01-27-09), claiming that all rules issued by the Pope are dictated by the Holy Spirit, and portraying salvation as if it were dependent solely on obedience. The messages confuse the infallible teachings of the Magisterium with the fallible decisions of the temporal authority of the Church. The messages do not acknowledge the existence of the non-infallible non-irreformable teachings of the authentic ordinary Magisterium. The messages make the false claim that the end of the world is near ("The final moment is close at hand!"). The messages make the false claim that the Antichrist is in the world today (message of 01-23-09). The messages claim that priests should never be married, in contradiction to the constant practice of the Church to permit some married men to become priests ("No, it is not for you, My Priest, to be a husband and father of children…. Remember that it is not right, Jerusalem, to defile the priesthood by committing a sexual act! This would be an abomination!" message of 01-13-09). 51. Janie Garza of Austin, Texas (http://www.sign.org) - promotes the same falsehoods as Ida Peerdeman; claims that 'the dogma' must be proclaimed; claims that the Lady of All Nations apparitions were true private revelation. 55. Ned Dougherty (www.missionofangels.org) - claims that June 6, 2006 is a day related to evil (6-6-06); claims "dark energy" is causing various kinds of problems in the world. 56. Frances M. Klug (www.themiracleofstjoseph.org) - claims that Saint Joseph is the Holy Spirit, and that he has come again into the world through Frances Klug. Condemned by the Bishops of Los Angeles, San Bernadino, and Orange County in this document. 57. Timothy Snodgrass (www.king1.tictacwebsites.com/page/page/3674670.htm) - claims a prophetic significance to the date of 6/6/06. 59. Patricia Talbot (a.k.a. Pachi) of Ecuador - claims that the Antichrist is in the world today. 61. Alois Irlmaier (interviewed by Conrad Adlmaier) (users.skynet.be/courlisius/alois.html) - makes false claims about the three days of darkness about about the wars that precede it. 62. Dr. Mary Jane Even (users.skynet.be/courlisius/preface_mary.html) - claims that the Antichrist is in the world today; claims the three days of darkness occurs the year after the Miracle [which is certainly not true]; vague predictions of bad weather. 63. The Two Patricks (www.thetwopatricks.org) - Patrick O'Kane and Patrick Rushe - claim that the Antichrist is in the world today; claims Christ will return for this generation; claims that the Gospels were written within days of Christ's death; worldly language and subjects; claimed (April 1, 2005) that Pope John Paul II would be replaced by "one who is not of Me;" claimed Pope John Paul II was overthrown; Patrick claimed (May 13, 2005) "that the pope that would come after John Paul II would be the deceiver, the abomination, the antichrist;" claims that 'Jesus' said (May 11, 2005): "The deceiver sits upon the Throne of My Peter" referring to Pope Benedict XVI. 64. Anna Marie of GreenScapular.org (greenscapular.org/Heavenlymessages.htm) - the green scapular devotion was approved in the 1800's, but this group, which has misappropriated that name, is just like the other false private revelations. Some of the errors: an incorrect description of the Warning, sensationalist messages about current events, vague predictions of unspecified disasters, etc. Fr. Melvin is associated with the false visionary Joyce Ann Wagner (Burbank, California). 68. Dominic Sanchez Falar (www.maryisgod.org) - formerly made the heretical claim that Mary is God and that she is the 'soul' of the Holy Spirit; claims that the 'Last Pope' and the 'True Antichrist' will fight to the death (so that both die); claims that Jesus went to Hell and could not leave until He had suffered all the suffering due as punishment for the damned in Hell. Sept. 16, 2008: Dominic has closed his website maryisgod.org and he has agreed not to call Mary as God anymore; he has ceased to promote his claimed private revelations (but still thinks that they are true). -- as per e-mails received from Dominic Sanchez Falar. Members of the group who receive visions respond with convulsions, vomitting; one girl responded by smashing windows until her hand bled from broken glass; the messages claim that Jesus is returning soon. False claims about the Chastisement, e.g. "1. Be sure that all your windows are closed. Cover it with a black Curtain so that the Devil cannot enter your houses. 2. Also have Blessed Grapes - This is your only food during the Chastisement." Claims that Allan can see a cross on each followers forehead, which brightens and dims according to their moods. He claimed, according to his private revelations, that the Warning of Garabandal would occur in 1995 (it did not). 78. JNSR (http://www.jnsr.be/uk.htm) - messages to an anonymous woman, who goes by the epitat: JNSR, claiming 'the complete Dogma' that Mary was conceived by the Holy Spirit, in a Divine conception. 81. Sister Anna Ali of the Pious Union of Daughters of Jesus, the Good Shepherd - a 'Union' founded by Archbishop Milingo (who himself was excommunicated twice by the Holy See). 82. Fr. Dennis Ward O.S.B. (osbfathers.com | osbenedict.com | both sites are now shut down) - According to Andrew Nugent O.S.B., Prior of the Benedictine's Glenstal Abbey in Ireland, Father Dennis Ward has never been a member of the Roman Catholic Benedictine order, and is not a licitly ordained Catholic priest. Dennis Ward was either not ordained at all, or was ordained by a schismatic group. Dennis Ward claims to be a Benedictine and also claims to have received private revelations from God. 84. Anne Marie White (http://users.skynet.be/courlisius/you_will_be_persecuted.html) - messages typical of false private revelation. 87. Anonymous Seer (http://giftstor.org/AnonymousSeer.htm) - false messages to someone who remain anonymous. 99. His littlest of servants (promoted by seers2 group) - There are serious doctrinal errors in this person's 'visions'. He claims a vision seeing a person who lacked the graces necessary to accept Jesus' Mercy. To the contrary, more than sufficient grace from God for repentance is always available to every sinner without exception, from the Cross of Christ. So it cannot be true, as he claims, that this person 'did not have the graces necessary'. Also, grace is before, during, and after any good act. So it is doctrinally false to claim that the mercy of Jesus is unable to be accepted due to a lack of grace: the grace before, during and after such acceptance is of the mercy of Jesus. He claims that a person near death, in his vision, was surrounded by demons ready to drag him into Hell as soo as he died. But it is contrary to Catholic teaching to claim that demons drag someone into Hell when they die, no matter how evil that person may be. The Church teaches that every person, when they die, stand before God in the particular judgment. Then the deeds of that person's life, good and bad, are reviewed, and God judges that person. Then, if they died in a state of actual mortal sin, that person is sent to Hell by God (see on the Beatific Vision of God, Pope Benedict 12). There is yet another message with the doctrinal error that claims the Orthodox Churches, and the Protestant denomination have no graces and no good in them because they are separated from the Roman Catholic Church. This contradicts the teaching of Vatican II. And there are other doctrinal errors in this messages and visions. 100. Mac Smith - (http://www.holymotherchurch.org/1656267.html) Our Lady of the Most Precious Blood messages claim that people will receive special blessings if they pray the Rosary while surrounded by a prayer blanket; claims that even Jesus does not know when events will happen in the future; claims that Mac Smith can bi-locate; claims that the Virgin Mary explicitly spoke about the group's website and that gave specific instructions about the website; claims the Virgin Mary said, "I blow a kiss to each one of you;" claims that in one of her appearances, Mary was only about 4 feet tall; claims Mary called herself: "the Mother of Queen of Heaven;" claims that if you say a certain Life Offering prayer, all your family members will certainly avoid Hell. Heretical teaching: messages claim that after dying, being judged by God, and being condemned to Hell, a soul can still be saved and go to Heaven, if someone prays for that soul. Heretical teaching: messages claim that all killing is a mortal sin without exception, even just war, death penalty, self-defense. 103. Giorgio Bongiovanni (http://www.giorgiobongiovanni.it/engl/biografia/index.html) - his messages are clearly false, and yet he has the stigmata; this is a good example of the fact that signs and wonders (in this case, the stigmata) can be associated with false private revelation. 111. Susan Cummings a.k.a. 'Rev. Susan Williams (Cummings)' - [In The Image Of His Glory Ministries] claims that "The Remnant Man-Child Company are now birthed forth, and are being positioned by God into their places!!!" 112. Cyndi Cain - the Hidden Flower of the Immaculate Heart - claims the Antichrist is in the world today: "all the while the antichrist works tirelessly to rule the world"
114. Mother Mary's Garden (http://www.mothermarysgarden.com/) - claims Mary is Divine and that women must be allowed to be priests. 119. Mother of Love messages to Marco at Paratico (Brescia) - Italy (http://www.mammadellamore.it/inglese.htm) - claims Jesus is returning physically for this generation; claims the tribulation begins before the Warning. 124. Brother R. G. Stair (overcomerministry.org) - claims that the Catholic Church is not the true Church, and that Jesus will return for this generation. 125. Great Dreams website (http://www.greatdreams.com/sitemap.html) - numerous false prophecies based on dreams by a number of different persons. 131. Marie-Paule Giguere of the 'Army of Mary' - claimed she was a living reincarnation of the Virgin Mary (Sept. 2007: the group has been excommunicated by the Holy See). 134. Giancarlo Varini - Gargallo di Campi, Italy (http://www.mammadellapace.it/index.htm) - claims an imminent return of Jesus Christ. 137. Dina Basher of Iraq - claims the return of Jesus is imminent. Very many messages to Ruth Wade claim that the Second Coming of Jesus is near, and they repeatedly strongly imply that this will occur for the current generation. This claim is common in the many false private revelations, and not found in any of the true ones. 160. Rose of the Holy Innocents (http://users.skynet.be/courlisius/some_coming_events.html) - messages claimed that the Pope after John Paul II would be called Peter II and would be the last Pope ever. 164. Denise Estrada (www.ahealingheart.net) - claims that Jesus will return to walk the earth soon; vague predictions of natural disasters. 165. Darell Bennett - (http://users.skynet.be/courlisius/terrible.html) claims that Jesus said he would act without mercy: "I will use my power, and there will be no mercy for sinners ... sinners who do not keep my commands are doomed ... I will have no mercy on them!" 167. Fraternite of Notre Dame and Bishop Jean-Marie Kozik - This bishop was illicitly ordained by a sede vacantist schismatic bishop (Thuc). Kozik claims private revelations from the Virgin Mary. The Fraternite of Notre Dame is not in communion with the Roman Catholic Church. 168. Raymond Aguilera (prophecy.org) - non-denominational; claims the world is ending soon and that Jesus is returning soon; numerous incoherent prophecies and vague visions; bizarre messages unlike the true Gospel message. 169. T. Chase (revelation13.net) - false prophecies based on bible code and astrology; makes the false claim that Vladimir Putin, President of Russia, is the Antichrist. 170. John of the Community of Saint Joseph of the 'Asylum City' in northern New Brunswick, Canada (www.asylcity.com/) - claim that their private revelations are part of 'the Third Testament of Holy Scriptures;' claim that the Rosary has been replaced by 'the Chaplet of the Father;' the man called 'John' claims to be the head of a new College of the Apostles; claim that Pope John Paul II was replaced by an imposter in 1996; numerous other patently false and heretical and schismatic claims. 171. Yahweh Shalom - Virgin Victorious (yahwehshalom-virginvictorious.com) messages to Lory Kemner of Climax Springs, Missouri. She is often called 'Child' in the messages. Numerous theological errors, and also historical errors about the lives of Christ and Mary. Claims a three years period of natural disasters in the calendar years 2007, 2008, and 2009. Claims that Jesus dictated the story of his life to her: "Jesus' Life - (Author: Jesus)" Claims that dozens of Saints have given her messages. 172. Colette Coulombe - claims messages from Saint Anne, e.g. : "Pray a lot and give me your projects, I will explain them in details to my Grand-Son Jesus; I will seduce Him because I love you." 173. Wenko Pasco - Taguig City, Manila, Philippines (http://deathtomycreditcards.blogspot.com/) - her website is about her problems with credit card debt and mishandling her own money; she claims a private revelation in which she was chosen by God to raise a very large sum of money to build a cathedral; there is no involvement of the Bishop or diocese in her project; she claims the cathedral will be a replica of a cathedral in Italy. She claims its garden will provide food for a city during a famine, but it is only on one hectare of land. She claims those who donate get special protection from Michael the Archangel, and that the cathedral will be a place of refuge during the tribulation (an idea often found in false private revelation). She claims that the present time is the 'end of days'. She claims that her parish church has hauntings from demons, and that she was chosen by God to exorcise those demons. 174. Theresa Lazar - messages supposedly from Jesus saying that "the Tridentine Mass is the only Mass that gives Me reverence," and, "I do not want to be on a ‘slaughter table’! Priests should face the east. There should be a relic on the altar." The messages claim that the God the Father said: "The Novus Ordo Mass is an insult, a cult." The messages treat the Pope and the Bishops of the Roman Catholic Church as if they have gone astray from the faith by letting people receive Communion standing and in the hand, by revising the Mass to the Novus Ordo, etc. These are false message designed to appeal to the biases of traditionalist Catholics. 176. Cassandra Musgrove - claims that the three days of darkness is caused by volcanoes; predicts a series of natural diasters. 177. George Kramme of Albuquerque, NM (www.apocalypsevision.org) - claims that Jesus will return for this generation; claims to have had a vision of a city; claims that Jesus spoke in a worldly manner: "I've got it! Don't worry about a thing! Everything's going to be alright!" 178. Dr. Gloria Constanza Polo (www.gloriapolo.net) - claimed private revelation based on her near death experience: She claims that God said He will punish those who don't listen to her. But the Church teaches that we do not have to listen to any claimed private revelation, it is not required belief. Her narrative about what happens after death contains numerous doctrinal errors: she claims she was sent to Hell without the particular judgment by God. She claims that while in Hell she was judged by her deceased parents, not by God directly. She claims she was sent to Hell, but then somehow escaped back to this life; this too is contrary to Catholic teaching. She claimed that most of the persons in Hell were young people, and she represents Hell as if it is just extreme torture for everyone, entirely out of proportion to the type and degree of their sins (as if God punishes in Hell without justice and without mercy). 179. messages at El Escorial (Spain) to Luz Amparo Cuevas (http://www.virgendolorosa.es/ingles.html) - makes the false claim that Mary is 'Co-redeemer of humankind'. Resembles other false private revelations. 180. Matthew Kelly of Sydney Australia - claimed to have received some locutions from God the Father in the 1990's, was told by the Bishop to stop speaking of this publicly and complied. He claimed a private revelation in which the Warning [of Garabandal] is called 'mini-judgment.' This idea is incorrect, since in Catholic teaching there are only two judgments, the particular and the general. The Warning show us the sins on our conscience, but it does not review the good and bad in one's entire life. Kelly's messages also claimed that man should never judge the action of themselves or the actions of others. This is a distortion of Catholic teaching. Though Christ taught us not to judge persons (Mt. 7:1), He also taught us to judge for ourselves what is just (Lk 12:57, Jn 7:24), which of course necessarily includes judging which actions are just and which are unjust. In my opinion, his claimed messages of private revelation are not from God. As for his books and talks, I would not trust them. 181. Roger Poisson, The Mission of the Shroud begun, of Winnipeg, Manitoba (http://www.missionoftheshroud.com/) - claims a private revelation for the purpose of teaching the Pope and the Bishops; claims that his messages will cause "the Spirit becomes alive inside of" the bishops; his messages are superficial, but claim to be profound insights; he claims that marriage makes the spouses 'born again' and 'a virgin again.' He makes a series of false claims about Adam and original sin; he states that there were millions of people on earth before original sin, and that when 'the sin' occurred, they all forgot that they used to be holy. He claims that the world 'was always existing'. In addition, numerous messages, supposedly said 'in the Spirit' are incoherent ramblings. 183. Dr. Paul Dhinakaran - Jesus Calls Ministries (jesuscalls.org) - claims that Jesus will return for this generation; claims that the antichrist rose up in 2008 and 2009; numerous vague predictions for the present time. 184. Myriam and Marie (http://detarle.club.fr/catho/Myriam_et_Marie.html) - two women, not their real names, who claim to receive messages from Jesus; vague predictions of disasters and catastrophes, the false claim that Jesus will return very soon (for this generation), false description of the Warning, the false claim that the Warning will occur before Christmas 2009. 186. Agnès-Marie, France (http://vincent.detarle.perso.sfr.fr/catho/sauv-agnesmar.htm) - claims that the Church will become a false Church and only a few will remain faithful, outside the institutional Church; false claims and fear-mongering about the swine flu (H1N1); warns of a so-called New World Order (as many other false prophecies also claim); portrays Jesus as if he were speaking in a worldly manner and instilling fear; claims that Jesus is returning for this generation; also promotes an idea similar to the Protestant rapture, claiming that the few who remain faithful will be lifted up during the time of the abomination of desolation. These false claims are similar to many other false private revelations. 187. Mary Constancio, the Ambassadors of the Flame of Mercy, (www.flameofmercy.com) in Shallowater, Texas. 191. Sister Raquel Reodica, RVM - her claims are much like the claims of the other false prophecies, listed above. 192. Duke Puntalangit of the Philippines - false claims about the prophecies of Fatima, false claims about the war, false claims about the Three Days of Darkness, and the false idea that Jesus will return for this generation. Update: Duke has repented of his false prophecies --- No, now he has relapsed, and is making false prophecies again. 193. Gabriele Bitterlich - her claimed private revelations represent the Christian Faith as if it revolved entirely around the battle between good and bad angels; it is occultism, not Christianity. 195. Choo Thomas and Sandra Sadiq (www.choothomas.com) -- both women promote the Protestant error of the rapture; Choo claimed that Jesus said the rapture was to occur in 2009. Sandra makes the false claim that receiving the mark of the beast (which she thinks is an RFID computer chip) prevents you from ever repenting of sin so as to be saved. 196. Bill Wiese -- yet another person claiming to have been given a private revelation of Hell. The usual doctrinal errors on Hell are asserted: the claim that the denizens of Hell continue to sin eternally; the claim that the devils are in charge of Hell (as if they were not sent their to be punished like everyone else); the claim that the punishments of Hell are not from the mercy and justice of God, but from the malice of the devils, for their amusement and pleasure, etc. 197. Ghanaword.com -- promotes false claims about the Antichrist and the mark of the beast; claims that receiving the mark prevents a person from ever repenting (this claim is contrary to Catholic teaching that we are always able to cooperate with grace and repent, no matter what we have done). Promotes the Protestant error of the Rapture and other Protestant ideas. 198. Kibeho, Rwanda -- false claims that Jesus will return for this generation (according to: Segastashya and Alphonsine). 199. Anonymous visionary, now calling herself "Maria Divine Mercy", at the web site: TheWarningSecondComing.com - promotes the false claim that Jesus is returning for this generation; promotes the false claim that the Antichrist is in the world today. The messages contain many vague predictions, teach multiple heresies, and attempt to convince the faithful to distrust the Church. See my post on her possible identity here. Off-site: Maria Divine Mercy True or False? Her bishop has publically stated that many of her messages "are in contradiction with Catholic theology". 200. Sabrina (www.messaggidelsacrocuore.it) - resembles other false private revelations; protrays Jesus as promoting the visionary's website: "My precious site.... " and even claims that the website is a path to salvation: "Soon My site will be born, that is it will be opened to the world, and from it My Eternal Divine Majesty will draw large and substantial glory for and in the salvation of My immortal souls, for whom I have shed all My precious Blood on the Cross." 201. Angelica Zambrano - her false vision of Hell portrays the souls there as if they are repentant, crying out for mercy. But the Church teaches that whoever dies unrepentant from actual mortal sin cannot repent after death. Her false vision of Hell portrays the devils as if they are the torturers of Hell and as if they enjoy being in Hell. Her false visions of Hell also portray Hell as a place where devils hold meetings in order to plan attacks on humanity (as if the devils could come and go from Hell whenever they wish). But Christ taught that God prepared Hell to punish the devils (Mt 25). -- Her false vision of Hell claims that everyone is Hell is continually blaspheming God forever. But this claim is false because it would be unjust for God to permit the innumerable devils and souls in Hell to continue sinning unceasingly forever. Hell is a place of the eternal justice of God, not a place of eternal sinning. Also, if they could sin, they would deserve more punishment; then as their sins continued to increase, their punishment would increase forever, to such an extreme degree as to be unjust. Again, this is not possible, since Hell is a place of proportionate just punishment. -- Her false vision of Hell claims that Pope John Paul II is in Hell, being punished for not preaching the truth. (Apparently, this claim is based on the fundamentalist Protestant point of view of the church to which Angelica belongs.) Her false vision of Hell makes the ridiculous claim that: "Anyone who listens to Michael Jackson's songs or sings them ... will end up in hell." The Church teaches that only those who die unrepentant from actual mortal sin go to Hell; singing a song or listening to a song are not mortal sin (even if the singer is sinful). Her false visions of Hell also claim -- I kid you not -- that children go to Hell for watching cartoons. All this should be sufficient to convince any faithful Christian that her visions of Hell are false. 202. anonymous "40 something year old husband, and father of four" (http://matthewsix25to34.wordpress.com/) -- These messages claim "that just about every illness begins in the soul and transpires from there to our bodies." This claim is contrary to reason and is not found in Tradition, Scripture, or Magisterium. The claim of "Spiritual Genetics" such that a sin is transferred from parent to child by propagation is contrary to Church teaching. God creates each soul at conception, so no spiritual illness can be transferrred to that soul. The created soul lacks sanctifying grace due to original sin, but nothing from the personal sins of an individual are transferred. The claim that Jesus is returning soon is false. Tradition and Scripture teach that many events must occur first -- so many that they cannot be fit into one generation. 203. End-Times-Prophecy.com - the blog of Mike Peralta, promoting claimed messages to Susan Davis (U.S.) and Sabrina De Muynck (Belgium) -- These messages make the false claim that Jesus is returning for this generation; the messages promote the Protestant false teaching of a rapture. The messages made the false claim that the rapture would occur in 2010. The messages claimed that the rapture would occur before the tribulation; they also claim that the tribulation has already started. False claim that the Antichrist is in the world today, and that he will try to implant computer chips in people. (These are common false claims in false private revelations.) These message claim that the messages to Choo Thomas (#195 above) are also true messages from Jesus. Choo's messages claimed that the rapture would occur in 2009. 204. Glynda Lomax (wingsofprophecy.blogspot.com) claims that Jesus is returning soon; claims that the Rapture will remove faithful Christians from the world prior to the tribulation. 205. "Locutions to the World" - Anonymous visionary at Locutions.org, whose messages are announced through a retired priest, Msgr. John Esseff. Messages claim that Russia was never consecreted as requested at Fatima, even though Pope John Paul II, Cardinal Ratzginer (now Pope Benedict XVI) and sister Lucy, the visionary of Fatima, all said that Russia has been properly consecrated. The messages are similar to the other false messages of the above false visionaries, including profane commentary on politics, economics, and current events. 206. Margaret Durbin, false locutionist, margaretdurbin2012.blogspot.com | newtimeprayers.blogspot.com -- the messages claim that the "true Holy Spirit" has not yet been sent upon the world; the messages claim that only six of the seven gifts of the Spirit have so far been given to the world. These claims contradict the teachings of the Catholic Church. The messages also confuse the Persons of the Holy Trinity, portraying the Father as saying: "I am the true Jesus Christ Who became man and was born of the Holy Blessed Virgin Mary, His Mother. I sacrificed for all of My children to suffer and die on the Cross for their sins, and they now say I am not The Father in Heaven? I am the true Father, the true God The Father." The messages also portray the Father as saying that He (the Father) is the Holy Spirit: "I am that True Holy Spirit" (God The Father, March 5, 2010). The messages portray the Father saying that He is the Virgin Mary: "All must know I am the true Holy Trinity, the true Father, the true Son, the true Holy Spirit. I am All Three. I am the true Holy Blessed Mary Ever Virgin. I am the Almighty God of the Universe." These messages are contrary to definitive Catholic teaching on the Trinity, and on the Virgin Mary. 207. Stefania Caterina -- She claims that she visits other planets and that God has created other populations in other planets. This type of messages is characteristic of false private revelation. The message of salvation in Tradition, Scripture, Magisterium, and in true private revelation is always about this world and this human race. The group of her followers say that they have no hierarchy, claim to be led directly by the Holy Spirit, and claim that "Any structure or hierarchy of human life in fact stifles the spirit." This type of doctrine implicitly rejects the hierarchy of the Church, and of the family, and of an ordered civil society. Some of the messages further undermine the Catholic Church by representing the Church as merely a collection of believers with different ideas, as if the Catholic Faith were not the truest form of Christianity. 208. Cletus Schefers and Verne Dagenais at www.GodSpeaksWillYouListen.org -- Clear eschatological errors, such as claiming that after the Warning, the Antichrist reigns, and then later the three days of darkness occurs. This order of events is contradicted by many different sources in Scripture and the writings of the Saints. The messages instill distrust of the Church, claiming that an evil antipope will take over, and the true Church will go underground. The messages reject of the Novo Ordo Mass, despite its acceptance by the Church. The claim is made that the Protestants will work with the antipope and the Antichrist against the true Church -- this contradicts the prophecy of the Virgin Mary at La Salette that the Protestants will return to true unity with the Catholic Church. 211. Elizabeth Kindelmann (theflameoflove.org) -- there are many indicators that this is a false private revelation, even in the few excerpts that they make available online: the claim that there is no greater movement in the Church; the suggestion that this claimed private revelation and its devotion will save the world; excessive talk about Satan and even implicit praise for him: 'for Satan there are no inaccessible places'; the bad spiritual advice that we should increase our desires as much as possible (To the contrary, Scripture says: "Yet truly, each one is tempted by his own desires, having been enticed and drawn away. Thereafter, when desire has conceived, it gives birth to sin." James 1:14-15); the false theological assertion that Jesus is suffering in Heaven; and poor theology: "From My Sacred Heart also, blood and water spouted out on you, and the powerful desire with which I did it for you." 212. Anonymous Visionary at locutions.org (http://www.locutions.org/) -- these messages are much like the messages of the other false private revelations, listed above. The messages make the false claim that Jesus is returning for this generation, along with the false claim that Israel will soon convert to Catholicism. The messages have worldly language, like calling the Pope "the game changer" and using phrases like "pros and cons". One message incorrectly defines "Papabile", which in the message is phrased "Popabile", as if it meant "able to be Pope". Instead, it refers to those candidates that are seen by the populace and the media as in contention for the papacy. The messages between the time Pope Benedict announced his resignation and the time that Pope Francis was elected are empty commentary, showing no knowledge of the future at all. Some of the messages at locutions.org comment on specific political situations. This, too, is indicative of false private revelations. One of the messages claims that Satan nailed Jesus to the cross, whereas the Church teaches that it is our sins, chosen by our free will, that (in a sense) nailed Jesus to the Cross. Also, I have noticed that visionaries who are anonymous are almost always false. There are many false private revelations in the world today. If any are from an anonymous visionary, you should consider them likely to be false. 213. Luz de Maria de Bonilla (http://revelacionesmarianas.com/english.htm) "Revelaciones Marianas" -- a false private revelation, making common false claims: distorting the meaning of the great Warning (predicted at Garabandal), claiming that the Antichrist is in the world today, claiming that the Antichrist will become Pope, and claiming that Jesus will return for this generation. All such claims are false. She also claims to have a group of priests following her, who remain anonymous. One message actually claims that we should "Pray, the Yellowstone volcano will mercilessly scourge all of humanity." But a true message from God would never ask us to pray for a merciless scourge on humanity. 214. "Pope Peter the Last" -- visionary and antipope who falsely claims to be the last true pope (http://testimonyofthetwowitnesses.com) Messages claim that Pope Benedict XVII and Pope Francis are antipopes. False explanation of blasphemy against the Holy Spirit; the Church teaches that this sin is final impenitence; the visionary claims it is the sin of rejecting his messages. False claim that the Antichrist is in the world today and about to take power (common false claim of false visionaries). False claim that Jesus is returning for this generation. Many other errors. 215. Linda Noskewicz at gods-messages-for-us.com -- makes the false claim that the justice of God "is a cruel and hard thing without the benefit of compassion and Mercy." Correct Catholc doctrine is that, in God, Justice and Mercy are the same; His mercy is always just, and His justice is always merciful. As is typical in false private revelations, the messages make an extreme distinction between the faithful and the lost. Correct Catholic doctrine on this point is found in the teachings of Jesus, who saw good in tax collectors, prostitutes, the Roman centurion, and other sinners. The messages make the false claim that "those who are not [ignorant], sin twice -- once for their behavior or action and again for their knowledge that it is a sin that they so willingly have committed." Correct Catholic doctrine is that every sin includes knowledge that the act is a sin; otherwise, the act is not a sin. So it is false to say that a person sins twice, once by the behavior and second by the knowledge. That is not the way that Catholic moral teaching works. 216. William Tapley (thirdeaglemedia.com) - claims the following: "it occurred to me to ask the Lord, 'who is the eagle of the Apocalypse' (Revelation 8:13). My thoughts immediately answered 'you are!'. This really startled me but I knew that it came from God and was not a product of my imagination." -- No, I think it was his own imagination and pride (or the words of a fallen angel). The false prophets on this list are all self-exalting. Tapley claims to be one of the co-prophets of the end times. He also speaks as if he is the judge over Pope Francis, to decide if he is good or bad. And his interpretation of the passages of eschatology in the Bible is absurd; it has nothing in common with the eschatology of the Saints and of the Church. 217. Bruce Cyr of Okotoks, Alberta, Canada (afterthewarning2016.com) -- false claims of private revelation from Jesus and Mary. Also, this man has plagiarized my work in eschatology to a severe extent. 218. Charlie Johnston (charliej373.wordpress.com/) -- claims visions and messages from an angel over 20 years. He says his "angel" has been giving him predictions of the future for 20 years, and many times these predictions were false. All holy angels have the beatific vision of God, so they cannot be mistaken about anything, even the future. 219. Bette Stevens (http://vvmint.org/blog/) -- Victorious vision ministries international -- resembles other false private revelations. A Protestant woman who claims to have message from Heaven. 220. Daughters of the Lamb of the Immaculate Conception (daughtersofthelamb.com) also known as Warriors of Mary (warriorsofmary.com), aka the Warriors of the Holy Sword of Mary, aka Daughter of the Divine Will, aka Holy Family Refuge, aka Children of the Renewal (childrenoftherenewal.com) -- false prophets love to give themselves all manner of special titles! These messages make the false claims that the Antichrist is in the world today, that Jesus is returning for this generation, that only persons in special 'refuges' will be protected, etc. 221. Virgin Mary Rose of Peace (divinamadre.org) apparitions to three seers -- false and heretical messages. In the messages allegedly from Mary, she calls herself "the Great Spirit of Peace" and "the Bird of Light" and the "Spirit of Wisdom" -- terms more aptly applied to the Holy Spirit. Then she also says that she was once "worshipped as the Great Maternal Spirit of Peace", as if worshipping Mary were acceptable to her. She also refers to the "Creator Consciousness" and the "Creator Universe". These are not terms acceptable to Catholic teaching. Some of the message seem to merge Native American religion with Christianity, for example, calling the Holy Spirit "the White Buffalo," then switching to call the Virgin Mary "the White Buffalo, the Spirit of the Earth, the Spirit of Life." The messages also claim that Jesus appointed 12 holy women, alongside the 12 Apostles. The messages divinize the Universe and include errors of pantheism along with many other errors. 222. Sister Maria Baran (formerly of) the Ukranian Greek Catholic Church (News Report) -- claimed to have messages from God, Mary, and the Saints. The monks and a priest who followed her refused to obey the Bishops and the Church, and instead obeyed only the order of this sister, who calls herself a "prophetess". The monks were removed from the religious life, by an order confirmed by the Roman Pontiff. Important Note: There are too many false claims of private revelation for me to list them all. If a claimed private revelation is not listed on this page, one cannot thereby conclude that it is true.